En liten video fra kokkekurset jeg og reisegruppen min var på i Udaipur, India. Oppskriftene finner dere her, her og her. You can substitute okra with other seasonal vegetable such as aubergine or cauliflower plus an extra cup of water. 1. Heat oil in a wok over a medium flame. Add onion and okra and stir. 2. Add red chili powder, ground coriander and turmeric, salt and stir. 3. Cover wok, redue heat and cook for 8-10 minutes, string frequently to prevent sticking. Serve with zeera rice and chapatti. 1. Heat oil in a wok over a medium flame. Add cumin, seeds, peppercorns, cloves, bay leaf, and cinnamon bark and stir. 2. Add onion and stir. 3. Add water and then rice and salt, and stir. Cover wrk, reduce heat and cook for 10 minutes until all water is absorbed. Serve. 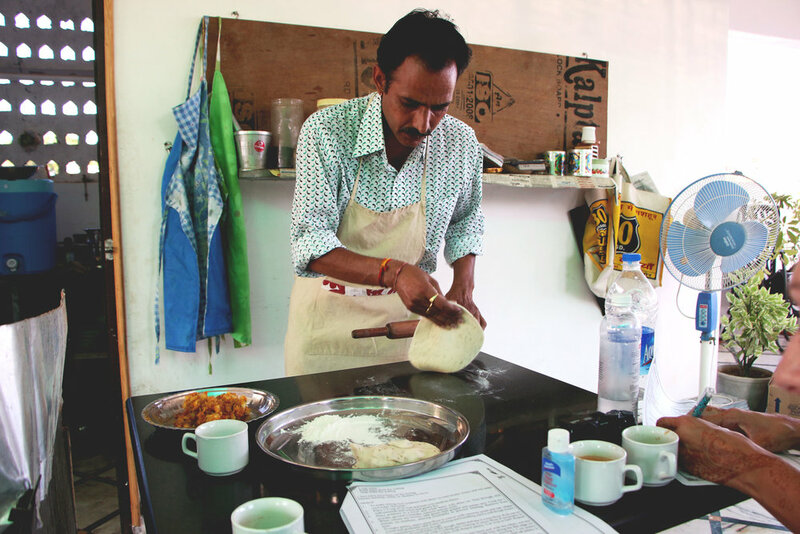 Chapatti is like a wholemeal pita bread, served with almost every meal as a healthier alternative to naan (also a type of bread). 1. Combine flour and salt in a bowl. Make a well and gradually add water, mixing and kneading until a soft dough forms with the consistency of pizza dough. 2. Take golf ball sized balls of the dough, flatten and dip in extra flour. Roll out on a cool, floured bench with a rolling pin, coating in more flour if necessary to prevent sticking, to create thin circles. 3. Heat a small fry pan over a medium flame and cook the chapatti for approximately 20 seconds on each side and then remove pan from flame. Place the chapatti directly on the flame until it blows up like a balloon. Flip quickly and cook other side on flame for around 5-10 seconds. Remove from flame and stack on a plate. Repeat until all are made. Also try adding green peas, boiled chicken or mutton. 1. To make filling, boil potatoes with skins on until tender. Drain and run under cool water. Set aside. 2. Place 1/3 cup oil in wok and heat over medium flame. 3. Add aniseeds and onion and gently fry. 4. Place potatoes in a bowl and crush them with skins on. Toss through chili powder, ground coriander, tumeric and set aside. 5. When onions are brown, add green chili pepper and potato mix. Cook for 1 minute on medium, stirring constantly to prevent sticking. Remove from heat. 6. To make pastry, place plain flour in a bowl with caraway seeds and salt. Make a well and gradually add water, mixing and kneading until a soft dough forms, the consistency of pizza dough. 7. Take golf ball sized balls of the dough, fatten and dip in extra extra flour. Roll out on a cool, floured bench with a rolling pin, coating in more flour if necessary to prevent sticking, to create a thin oval shaped pastry. Cut oval in half. Repeat until finished. 8. To make samosas, take a pastry half in one hand and with the other, wet the flat edge. Roll on corner in, creating a point half way along the flat edge, to form a cone, seal with wet edges. Fill with potato mix, leaving 1.5 cm pastry at top. Wet pastry edge and seal, forming a triangle. Repeat until all pastry is used. 9. Heat oil in a wok over medium flame. Deep fry samosas for 8-10 minutes, turning half way through, until golden brown. Remove from oil with a slotted spoon and drain on paper towel. 10. Serve with tomato ketchup, relish or chutney. You can substitute paneer with tofu or ricotta cheese. 1. Wash spinach leaves in hot water, drain and blend until pureed. Set aside. 2. Puree onions with a little water until a thin soupy texture forms. 3. Heat oil in a work over a medium heat, add cumin seeds and then onion puree and cook for 2-3 minutes. 4. Add green chili pepper, garlic and ginger and stir. 5. Add red chili powder, ground coriander and turmeric, salt and water and cook for 2-3 minutes. 6. Add spinach puree and paneer and stir well. Reduce heat and simmer for 12-15 minutes. Serve with zeera Rice and chapatti. Dal is Hindi for lentils. This recipe typically uses a combination of red, yellow and white lentils. 1. Heat oil in a wok a medium flame. Add peppercorns, cloves, bay leaves and cinnamon. Stir. 2. Add red chili powder, ground coriander and turmeric, salt and water. Cook for 2-3 minutes until oil rises to surface. 3. Add lentils and simmer for 10 minutes. Thin dal to taste for thin dal served the Indian way, add around 2 cups of water to create a soupy consistency. Serve with zeera rice and chapatti. Når jeg reiste rundt i India, var jeg som sagt på et kokkekurs i Indias romantiske by, Udaipur. Maten var virkelig nydelig. Den fine utsikten og det koselige utekjøkkenet til kokken gav kokkekurset en spesiell sjarm. Her er oppskriften til det første vi lagde, teen India er kjent for; Masala Chai. En veldig god te vi fikk servert mange ganger på turen. Den er heller ikke noe vanskelig å lage. Oppskriftene er skrive rett fra heftet vi fikk med oss, og er derfor på engelsk. Håper det smaker! Masala is the Hindi name for mixed spices. 1. Pour milk and water into a saucepan and heat over a medium flame. Add sugar and black tea. 2. In a mortar and pestle, crush cardamon pods and peppercorns and add to saucepan with ginger. 3. Increase heat until milk gently boils, stirring regularly to prevent it bubbling over. 4. Filter tea through a fine sieve and serve. Resten av oppskriftene til maten vi lagde på kokkekurset kommer snart! En nydelig kveld i Udaipur ankom det fem spente turister til en takterrasse midt i byen. Mannen som skulle lære oss å lage ulike indiske retter den kvelden, hadde vi allerede hilst på fra målekurset tidligere på dagen. Det var samme familien som drev matlagingskurset, og å kokkelere var hans lidenskap. Masala Chai (indisk te) stod først på menyen, som vi koste oss med mens vi lagde resten av rettene. Alt av redskap hadde han på et knøttlite kjøkken. Det fine, dekte bordet ble etter en stund fyllt med samasa, palak paner, dal, en blanding av grønsaker (aubergine), zeera ris og chapatti (brød/lefse) - alt som vi selv hadde vært med å lagd. Vi hadde turens beste middag, og koste oss gløgg ihjel hele kvelden. Vi fikk heldigvis med oss alle oppskriftene, så en vakker dag skal jeg prøve å lage indisk festmiddag her hjemme.